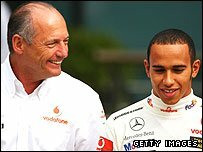 For nearly four decades, Ron Dennis has been running motor racing teams, and for most of that time they have been at the front of the grid. His life and reputation have been defined by drivers, engines and trophies. And yet now Dennis is on the verge of stepping away from the front line of Formula One. Depending on who you choose to believe, he may go just before the start of the season or he may linger to oversee his team's opening salvos. There are even some within his organisation who think he will stay until the end of the year, hoping to embrace one more world championship title, but they are probably in the minority. Dennis has three roles at McLaren - chairman and chief executive officer of the McLaren group, and boss of the Formula One team. Most people expect Dennis to walk away from at least one of those roles sooner rather than later. It is possible he may stay involved with the F1 team in some capacity afterwards, and that he will still go to some of the Grands Prix. Nevertheless, so constant has been Dennis's visible presence as the head of McLaren that, when he makes the decision, it will effectively mark the end of a remarkable career in top-flight sport. McLaren have competed in the F1 championship under his guidance since 1981; within four years, they were an established force within the sport and very rarely have McLaren drifted away from the sport's forefront. They have employed some of F1's great modern drivers - Niki Lauda won the team's first drivers' title under Dennis; Alain Prost secured three crowns in the team's cars, while Fernando Alonso and Lewis Hamilton just missed out last season. Yet, above and beyond any of these three, there are two drivers with whom he was most closely identified. They are Ayrton Senna and Mika Hakkinen, both of them McLaren world champions, both of them hard-charging drivers with international appeal. And in both cases, they were sportsmen who struck up a close bond with Dennis, a paternalistic relationship in which he was cast less as team principal and more as mentor. That paternalism has been seen again in the way he has mentored Hamilton from the age of 12 all the way to F1 - a risky, unconventional decision that has paid off in spectacular fashion. And that gets to the very heart of what has inspired Dennis. His happiest times have come when he has succeeded with the people in whom he appears to have invested personal commitment, when he has been afforded a sort of vicarious pleasure in seeing his proteges triumph. Senna's death upset him profoundly. Just a few months ago, I spoke to Dennis about the Brazilian, and still there was emotion in his voice, and depth in his eyes. "Ayrton was simply an extraordinary human being," he said, and gently shook his head. 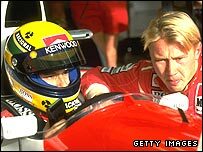 Hakkinen had his own enormous accident, nearly dying at the wheel of a McLaren in Adelaide in 1995, yet he recovered to win two titles, and the professional bond between him and Dennis became unbreakable. There was a bizarre and unwelcome symmetry last month when the marriages of both Dennis and Hakkinen broke up within a few days of each other. Certainly for Dennis, it was a moment of great upheaval. Already it has become clear that a desire to spend more time with his children is central to his decision to question his future in motor racing. So, too, is the ongoing aftermath of last season's spying accusations, when the reputation of both Dennis and his team was badly bruised. And it is not as if those allegations have gone away. An Italian police inquiry continues, and Dennis has been questioned by officers who travelled from Modena to Surrey. For a man who prides himself on fastidious planning and flawless presentation, it must have been a humiliating experience. Embarrassing, too, for Mercedes-Benz, whose financial benevolence bankrolls McLaren's racing enterprise. They have long supported both team and team principal; now, that loyalty is a little more strained. The conclusion of this story now seems obvious. Dennis has said very little in public about his future other than to confirm that it will be Martin Whitmarsh who will succeed him at the head of McLaren. Yet few doubt that the passing of the crown will happen sooner rather than later. But when? 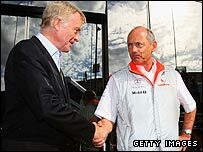 Well that, it seems, will be Ron Dennis's final decision, and he may choose not to rush it.